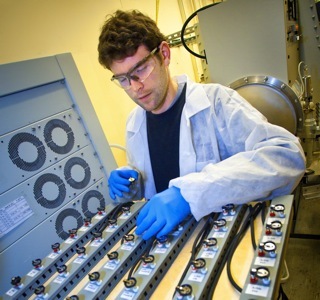 Tommy Conry loading a lithium coin cell for testing at LBNL's battery lab. We’ve reported extensively about AB 32, California’s 2006 greenhouse gas reductions law that calls for 1990-level carbon emissions by 2020. But what happens to carbon reduction efforts beyond that date? A less publicized, yet more aggressive 2050 target calls for slashing carbon emissions to 80% below 1990 levels by mid-century. That goal was established by an Executive Order by Governor Arnold Schwarzenegger in 2005. Achieving such an ambitious target will require a range of initiatives, including building better batteries. AB 32 calls for 33% of California’s energy to come from renewable sources by 2020. But while solar and wind energy produce zero carbon, they also fluctuate. The current solution is to balance those fluctuations with fast-ramping natural gas-fired power plants. And they produce carbon aplenty. Jim Williams, chief scientist at San Francisco-based consulting firm Energy and Environmental Economics, says that as renewable energy penetration increases, carbon emissions will drop — but only to a point. According to a study he authored in the Nov. 2011 edition of Science, once we get beyond 74% renewable sources, carbon emissions will swoop upwards again. The cause would be the rapid on-off cycling of natural-gas fired power plants, which emit the most carbon dioxide at startup. Not all storage devices are batteries. Hydro pumps, compressed gas and flywheels are already in limited use to store excess energy. But batteries are ideal for the grid. They can provide power instantly, and from any location. The problem is, they still can’t store very much energy. 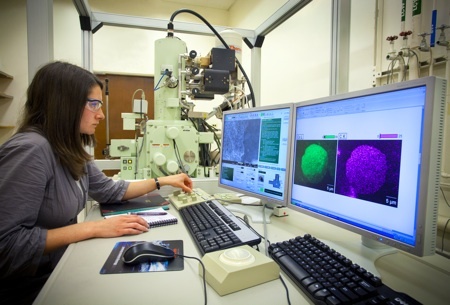 Barbara Le-Roux at the SEM ( scanning electron microscope), used to characterize the microstructure of the different materials. The Bay Area is already home to more than 30 startup battery companies, many of which are struggling with ongoing R&D hurdles, as well as the lack of a clear market. Recently, researchers and policymakers convened at the 2012 Silicon Valley Energy Storage Symposium to assess the state of the regional battery industry, and how to strengthen it. Much of the “electrical buzz” was around CalCharge, a recently formed consortium between Lawrence Berkeley Labs and the California Clean Energy Fund (CalCEF), which will connect local battery startups with the world-class research facilities at Lawrence Berkeley Labs. The California Public Utilities Commission is currently establishing procurement guidelines for energy storage, which will create a more stable environment for startups aiming to market their innovations. Prev The New Cap & Trade Battlefront: How to Spend the Revenues Next The Far-Reaching Effects of Smog: Is It a Driver of Drought?